When our guests arrive at the hostel we love to recommend a walk through Society Hill to them. Society Hill is one of the most beautiful neighbourhoods in Philadelphia, and it’s just south of the hostel. Its streets are filled with red brick buildings from the 18th and early 19th century that you cannot find anywhere else in America. Since 1999 all buildings façades and the cityscape have been protected. Therefore they still show the harmony, scale, materials and rhythm of rowhouse construction and the original pattern of Philadelphia’s streets from the City Charter of 1701. We recommend to walk down 3rd Street. It will take you past the Independence Living History Center and the Philadelphia Exchange. The Philadelphia Exchange was designed by William Strickland and is an exquisite expression of the Greek Revival style, the first national American architectural style. Across the street lays the Bishop White House, which is notable for as one of the first houses to have an indoor “necessary,” at a time when most privies were built outside. Further along 3rd Street you will pass the Powel House. This elegant town house from the 18th century was home of Samuel Powel, the first mayor of Philadelphia after the creation of the United States. He often hosted such notable guests as George Washington, John Adams, Benjamin Rush, Benjamin Franklin, and the Marquis de Lafayette. After the Powel House, take a left on Spruce Street and an immediate right into America Street. At the end of this very picturesque street turn left and make a right at 2nd Street. 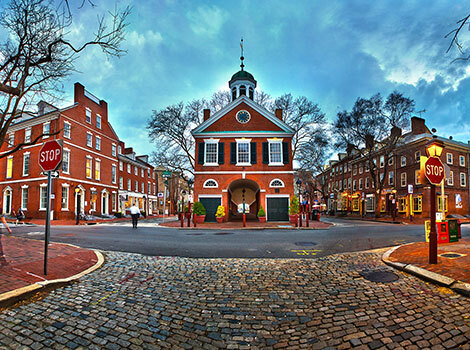 You are now reaching Headhouse Square, one of the oldest markets in Philadelphia that is still in use. It got its name from the fire engine house which borders one side of the market. A Farmers Market takes place every Saturday and Sunday between 10am and 2pm in the so-called Shambles behind the Headhouse. After passing the fountain on Lombard Street you made your way through Society Hill and hit South Street. From here we recommend walking east to try a Cheesesteak and to check out the Magic Garden at 10th and South Street. We hope you will enjoy this walk through one of Philadelphia’s oldest neighbourhoods. Feel free to post comments here and let us know about your own experience. You can also download these information including our map as a pdf file here.